EAST LIVERPOOL — The East Liverpool boys’ basketball team went through some growing pains playing extremely youthful squads the past two seasons. 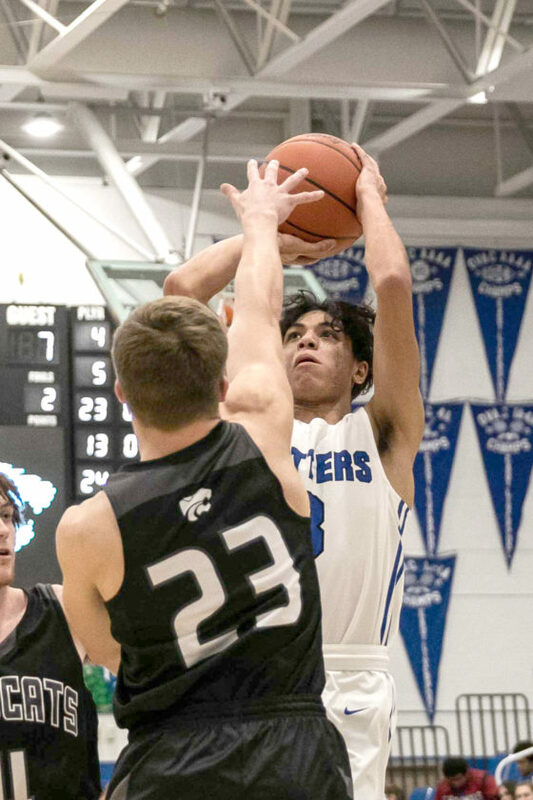 But that’s paying big dividends this year as the veteran Potters rolled to their second win in as many games, posting an 80-51 Buckeye 8 Athletic League triumph over visiting Edison Local Tuesday night. The Potters (2-0 overall, 1-0 in the league) have won their first two games of the season by 19 and 29 points over Wellsville and Edison, respectively. “They (Edison) beat us last year, so it was a good revenge game,” said East Liverpool head coach Nate Conley. With the setback, Edison, which has been beset by injuries, fell to 0-2. East Liverpool displayed outstanding offensive balance against the Wildcats as nine players dented the scoreboard, led by an all-round outstanding effort by senior guard Gabe Roach who took game scoring honors with 24 points. Roach was all over the court, converting layups off turnovers while finding his teammates with some sharp passes underneath for baskets. Also reaching double figures for the Potters were James Maxwell with 15 points and two blocked shots while Nick Woodyard finished with 10 markers. Edison was paced by Zac Easter with 10 points while teammate Alec McBane added nine points. The Potters jumped out to an 8-0 lead in the first 1:28 of the game and never trailed, led by Roach who tossed in 14 first-half points, many coming on layups after Edison turnovers, while Maxwell was all over the court, rebounding, blocking two shots and adding 12 first-half points, including a pair of three-pointers. Zac Easter led the Wildcats in the first half with five points, but turnovers and missed free throws plagued Edison in the opening two quarters as they trailed the Potters 18-11 after one period and 35-20 at the break. Edison finished with 22 turnovers in the game and found itself chasing the Potters and the scoreboard. “I give Edison credit, they are a fundamentally sound team, they run the flex offense and we had to do some adjusting to that at halftime,” said Conley. East Liverpool led 63-35 after three quarters and took its largest lead of the night at 24 points (77-43) following a hoop by Woodyard with 3:12 left. Edison outscored East Liverpool 8-3 in the remaining time to trim the final deficit to 29 points. ¯ East Liverpool’s JV team (now 2-0) rolled to an 80-25 win over the Wildcats (0-2). Tyler Roe led the Potters with 14 points, while teammate Cam Beverly and Izaihe Browning added 12 markers each. Owen Hughes paced Edison with 11 points. 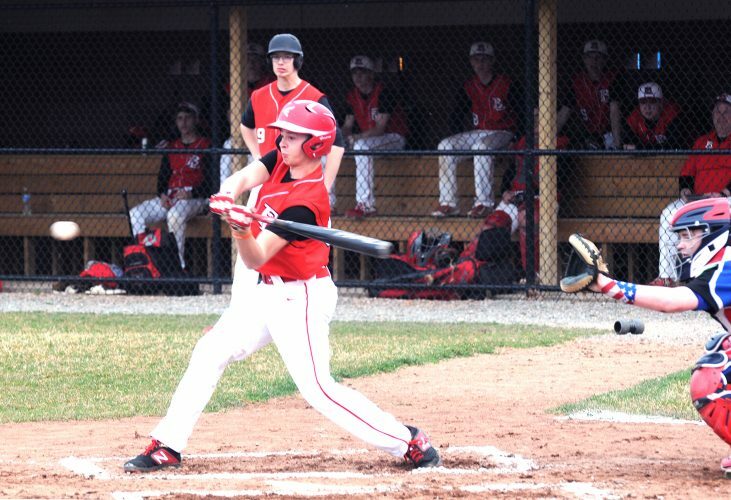 ¯ The Potters have another Buckeye 8 Athletic League North Division tilt on Friday night when they make the short trip to Beaver Local to play the rival Beavers. ¯ Edison Local also has a Buckeye 8 North game Friday night when it entertains the Buckeye Local Panthers. EDISON LOCAL SCORING: Gage Robinson 0-0-0, Zac Easter 6-3-16, Bryce McAfoose 4-0-8, Isaac Schmitz 3-0-6, Brennan Scott 1-0-2, Andrew Kinney 1-0-2, Alec McBane 3-2-9, Andrew Pugh 3-0-8, Isaac Zastudil 0-0-0. TEAM TOTALS: 21-5-12 51. EAST LIVERPOOL SCORING: Nick Woodyard 4-1-10, Brennan O’Hara 4-0-9, Timmy Neal 2-2-6, Gabe Roach 11 2-24, Levi George 1-0-3, Tresean Jackson 2-0-4, Peyton Reed 0-0-0, Tyler Roe 2-0-4, Sabaan Razi 0-0-0, Izaiha Browning 1-3-5, Cam Beverly 0-0-0, James Maxwell 5-3-15. TEAM TOTALS: 32 11-13 80. Three-point goals: Edison Local 4 (Andrew Pugh 2, Alex McBane 1, Zac Easter 1). East Liverpool 5 (James Maxwell 2, Nick Woodyard 1, Brennan O’Hara 1, Levi George 1).